Missing Endangered Person: Patrick T. Morrisey, 22, Male, Caucasian, 5' 6", 130lbs. Last seen: Saturday, March 16, 2019 at 10:00 AM. 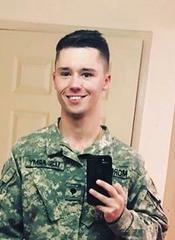 The Absecon Police Department is seeking assistance from the public in locating a 22 year-old Missing Endangered Person, Patrick T. Morrisey. He was last seen on Saturday, March 16, 2019 at approximately 10:00 AM leaving his residence on Natalie Terrance in Absecon. He is 5’ 6”, 130lbs., Caucasian male, thin build, blue eyes, and brown hair. He has a tattoo on his left bicep with cursive writing. He was last seen wearing a black leather jacket carrying a camouflage backpack. Morrisey is suicidal and has exhibited delusional and paranoid behavior in recent days. Those closest to him reported this behavior as out of character. Morrisey is a mechanic with the Army National Guard on active orders and currently enrolled at Stockton University. Anyone with any information on Morrisey’s whereabouts are urged to contact the Absecon Police Department at 609-641-0667.